The film's eight awards were for Best Actor (Ben Kingsley in a debut lead performance), Best Screenplay, Best Cinematography, Best Art/Set Direction, Best Film Editing, Best Costume Design - and director Attenborough won two Oscars - for Best Picture (as producer), and Best Director. 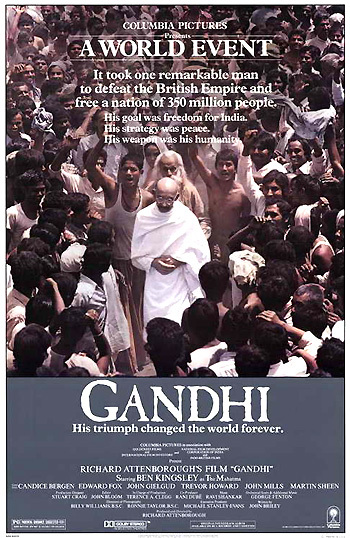 Its tagline described Gandhi's achievements: "A WORLD EVENT - It took one remarkable man to defeat the British Empire and free a nation of 350 million people. His goal was freedom for India. His strategy was peace. His weapon was his humanity. His triumph changed the world forever." And finally, in the Best Supporting Actress category, Jessica Lange (who was also nominated and lost in the Best Actress category for her tortured portrayal of the lead character in Frances) was nominated and won for her role as Julie Nichols, 'Dorothy's' unknowing, submissive best girlfriend in Tootsie. One of Lange's co-stars, Teri Garr (with her only nomination) was also competing in the category for her performance as Sandy, Hoffman's unemployed and rejected girlfriend. And Kim Stanley (with her second and last unsuccessful nomination) was nominated for her role as Lange's mother in Frances. 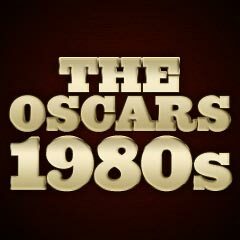 The Best Original Song category had fierce competition, with "Up Where We Belong" (An Officer and a Gentleman) edging out strong nominees including: "It Might Be You" (Tootsie) and "Eye of the Tiger" (Rocky III). This year, an Honorary Award was presented to Mickey Rooney, "in recognition of his 60 years of versatility in a variety of memorable film performances." Rooney had earlier won a Special Oscar in 1938 (co-awarded to "juvenile player" Deanna Durbin), and had acquired four nominations (with no wins) - two Best Actor nods for Babes in Arms (1939) and The Human Comedy (1943), and two Best Supporting Actor honors for The Bold and the Brave (1956), and The Black Stallion (1979). Except for its Best Original Screenplay nomination (for director/writer Barry Levinson's debut film), Diner was devoid of other nominations for its cast, such as Ellen Barkin for her role as Daniel Stern's neglected wife Beth. And Ridley Scott's Blade Runner was sorely under-appreciated (with only two nominations for Best Art Direction/Set Decoration and Best Visual Effects - and no wins), lacking Best Picture and Best Director nominations. In addition, Jordan S. Chronenweth's Cinematography, the Costume Design, and Vangelis' Original Score also suffered the Academy's lack of recognition. Both director/co-writer Jerzy Skolimowski's political allegory and compelling drama Moonlighting and director/co-writer Wim Wenders' complex film about film-making, The State of Things, lacked nominations of any kind. George Miller's Australian film The Road Warrior with Mel Gibson was nomination-less, as was Paul Bartel's black comedy Eating Raoul, and director Fassbinder's West German film Lola. Other acting nominations were denied Albert Finney and Diane Keaton as a broken-up married couple in Alan Parker's Shoot the Moon, and Jeremy Irons as Nowak - a Polish workers' foreman in Moonlighting. Director/writer Walter Hill's buddy cop/criminal film 48 HRS (with no nominations). was lacking in nominations for leads Nick Nolte and Eddie Murphy. And in an early role, Sean Penn was snubbed for his memorable portrayal of stoned surfer-dude Jeff Spicoli in Amy Heckerling's coming of age teen-comedy Fast Times at Ridgemont High. Tobe Hooper's effective horror film (with producer/co-screenwriter Steven Spielberg), Poltergeist, received only three nominations (without wins): Best Original Score (Jerry Goldsmith), Best Sound Effects, and Best Visual Effects. There were no nods for the psychic Tangina (Zelda Rubinstein), young Carol Anne Freeling (Heather O'Rourke), the two main leads (JoBeth Williams and Craig T. Nelson), the screenplay, or the director. Two films suffered, in particular, because there were only three nominees for Best Visual Effects. Star Trek II: The Wrath of Khan, a blockbuster film, was devoid of nominations - for Ricardo Montalban's performance as Khan Noonien Singh, for James Horner's musical score, or for the film's visual effects. Also amazing was that another film with fantastic visual effects, Jim Henson's Muppet-fantasy The Dark Crystal (with no nominations), was passed over in many categories (technical awards and score, to name a few). Alan Parker's expressionistic rock musical Pink Floyd: The Wall was also overlooked, especially in the Best Original Song and Best Sound categories.